The Horror Movie BBQ: Remembering: Hello Mary Lou Prom Night 2! Remembering: Hello Mary Lou Prom Night 2! In my very first entry of this blog, I discussed my history of how I became a fan of horror. And since that first blog, I've gone into discussions about vhs, memorabilia, and a few other things. But now, seeing as this IS a horror blog, I thought I'd take a look at one of the movies I discussed in that very first blog. A movie that I hold a lot of love for. A movie that never really caught on like it's predecessor. This entry is dedicated to Hello Mary Lou Prom Night 2! And with prom season just around the corner, why not celebrate my personal favorite in the series! Before I get into this movie, perhaps it would help by explaining that while it has title "Prom night 2", this film was NOT a sequel to the original Prom Night starring Jamie Lee Curtis and Leslie Neilsen. In fact the only theme that remained are Hamilton High's prom. Other than that, it has absolutely no ties to the first movie. In fact, without the title "Prom Night 2", this is an entirely different movie with all new characters, an entirely different story and a much different tone. Indeed while the first Prom Night was a pretty dark and serious horror film, Prom Night 2 delivers a little more tongue in cheek and lighter tone with it's story. And, in my opinion, makes for a more entertaining movie. The first Prom Night movie has been called "boring and dull" by many others in the horror fandom and I wholeheartedly agree. I saw it as a Halloween ripoff with prom being the theme. However it should be noted that out of four Prom Night movies and 1 remake, Mary Lou Maloney is the ONLY character to be featured in more than 1 movie. And an even more interesting note, Brock Simpson, is the only actor to play in each of the original Prom Night films, playing a different character in each film. It should also be noted, he is the son of produce of the first Prom Night and executive produce of Prom Night 2, Peter S. Simpson. Now, let's get down to the story. Be warned: THIS DOES INCLUDE SPOILERS. The story of Hello Mary Lou goes as follows: In 1957 the lovely Mary Lou Maloney(played by Lisa Schrage) was taken to the senior prom by Bill Nordam(played by Michael Ironside). Later in the night, Mar Lou decides to go home with another guy, upsetting Nordam in the meantime. Bill then decides to get revenge on his former sweetheart by lighting a stink bomb and dropping it on her during her prom queen coronation. But in doing so, he sets her on fire! Talk about a hot date! Mary Lou goes up in flames and perishes. 30 years later, Vicki Carpenter, a prom queen candidate roams around the basement of Hamilton High and opens a trunk with Mary Lou's sash and crown. In opening this sacred trunk, she unleashes the curse of Mary Lou. Many tragedies then hit the school and Vicki gets possessed by Mary Lou's spirit. Meanwhile, Bill Nordham has become principal of the school and witnesses all of these strange occurrences. His son, Craig is Vicki's by chance and the sins of the father are passed on to the son as he too is in the middle of these events. 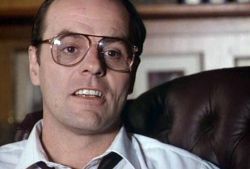 Michael Ironside as the Principal with a secret! Vicki's personality goes from quiet, mousy wallflower to a seemingly stuck in the 50s wild child. On the road to prom, she single handedly eliminates her religious fanatic mother, Father Cooper (who was the young man Mary Lou ditched Nordham for in 1957), and her friend Monica in the most disturbing scene in the movie when she is crushed in her own locker. Vicki, invoking the spirit of Mary Lou Maloney and Joanie Cunningham. Prom night finally comes, and many more bodies will lie in the morgue after the night is through. Vicki finally gets her crown and in doing so resurrects Mary Lou herself. After a nightmarish prom, Mary Lou's crown is returned to her. Apparently, all these shenanigans were all over Mary Lou getting her crown back. Yep. You read back. A scene is then shown of a young Bill Nordham and Mary Lou dancing at their prom before we cut back to 1987 with Vicki being rescued out of the same trunk all these events started from her boyfriend. Bill then drives off playing "Hello Mary Lou" and then movie ends. Now, from the way I typed out the story, it may seems like I couldn't care less. But in fact, this movie has it's charm. The movie invokes spirits of Carrie and Nightmare on Elm Street while peppered with fun special effects, including a wild "chalkboard jacuzzi" and a possessed riding horse in Vicki's bedroom. The death scene that I spoke of involving Monica sticks out like a sore thumb and is usually remembered by anyone who witnesses it. While the young cast wasn't known before or after, many have moved on to somewhat successful work. Justin Louis who plays Craig Nordham, went on to play Art Blank in Saw 4 while making many co-starring roles in tv and movies. Wendy Lyons and co-star Terri Hawkes went on to play Queen Serenity and Sailor Moon in the wildly popular anime, Sailor Moon. In 2003, a region 1 DVD release of the movie was released and Canada. It would be 5 years until it finally came to American DVD markets with a release coinciding with the remake of Prom Night and even found itself on a triple feature disc with Carrie and Swimfan. Between it's original release in 1987 and now, it has been shown frequently on TV as a weekend movie in different parts of the country and of course USA Up All Night. A fun piece of trivia: Many have said that the theme of "Seinfeld" plays while the camera cuts to a scene where Craig and Vicki enjoy a breakfast at diner called "Jerry's".This is absolutely false. 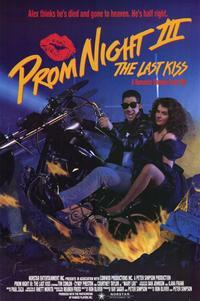 In recent years, the Prom Night series got a real shot in the arm with the remake of the original. And when that film flopped and failed miserably, the hopes of any sequel got flushed down the toilet. Who knows, maybe one day we'll see Mary Lou come back, but it seems doubtful. Until then, it's great to know that Mary Lou finally got her crown. Yep, a direct to video sequel was released in 1990. However, I won't touch this with an entry. Got to admit, Prom Night II is a very, very fun movie.